I have been asked a few times for a blog post on how to conduct a proper literature review. This is hard to do sometimes because a lot of people have different methods to do their reviews of the literature (see examples here, here, here and here). I tweeted a few of the steps I undertake, but I figured the easiest way to do this was to actually write a full blog post with the protocol I follow. I usually teach my students (graduate and undergraduate) and my research assistants how to do each one of the steps, so I will be walking you through my own process, rather than any generally accepted version of a method for reviewing the literature. You can apply much of the research process (citation tracing, concept saturation, finding anchor authors and creating subheadings that are based on questions to be answered) to the process of creating an annotated bibliography. Right now I am doing a review of the literature on online activism for environmental protection purposes. This isn’t a topic that is entirely new to me, because I do know some of the work and a few of the authors who have studied this particular issue, or at least online activism. Among these I can count Dr. Melissa K. Merry (University of Louisville), Dr. Dave Karpf (George Washington University), Dr. Deen Freelon (American University) and Dr. Meredith Clark (University of North Texas). 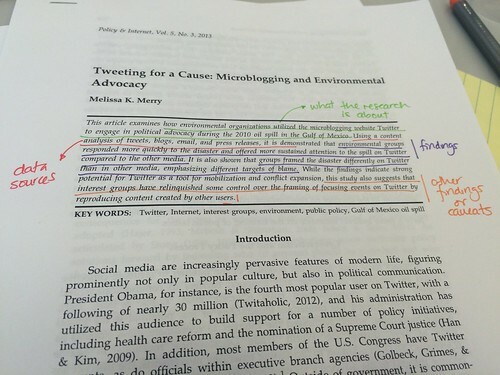 Melissa’s work is specifically on how environmental advocacy organizations have used Twitter, so citations to her work, and the papers she cites are the backbone of the literature review. Deen, Dave and Meredith have researched online activism, so their publications should be part of the contextual components. An element of undertaking a literature review that almost nobody tells you about is the serendipitous nature of finding a specific author. For example, while I have tweeted quite a lot, and I knew of the work of Dave Karpf on online activism because I followed him on Twitter, I didn’t know about the work of Melissa until she became my discussant at this year’s Midwest Political Science Association conference and I Googled her work, which is COMPLETELY relevant to what I am studying right now. I knew of Deen and Meredith’s work and their study of #BlackLivesMatter because I had followed it on Twitter. 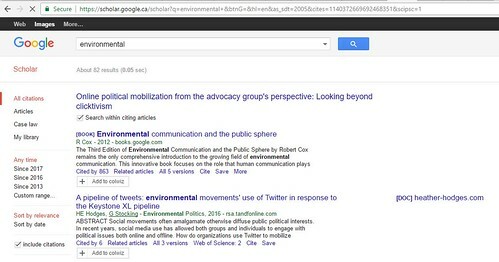 But it took me a citation tracing process based on Dave’s 2010 piece to find Heather Hodges and Galen Stocking’s article on Twitter activism against the Keystone XL Pipeline, which is VERY much specific to what I am researching now. So much of what I come across is actually rather serendipitous. Heather and Galen’s paper then became also part of the list of the anchor authors. 1. Identify the main topic and the anchor authors. The first stage of undertaking a literature review is identifying the main topic for the review, and a few key authors, what I called in the previous paragraph, the anchor authors. For example, for this review I’m doing on online environmental activism I identified three articles by Melissa, one by Dave, as my foundation ones. As I mentioned in the prevous paragraph, from reading and summarizing Melissa and Dave’s articles, I found other authors who have done relevant and similar work, like Heather Hodges and Galen Stocking. I used citation tracing both in the case of Melissa and in that of Dave, and that’s how I converged on the Hodges and Stocking article (both Melissa and Dave were cited in their piece). 3. Read, summarise, synthesise, WRITE. Once I found more relevant articles, I started reading and summarizing them, and creating my Conceptual Synthesis Excel Dump. As I have mentioned before, while I create one for each research project I undertake, I don’t believe the Conceptual Synthesis Excel Dump should be submitted as part of a project report, but it IS an important component. That is, your Excel dump should exist, and it should encompass all the literature you have reviewed, but it’s not a product that a funding agency might be interested in publishing or even posting online. 4. Generate the main themes for your Conceptual Synthesis Excel Dump and headings for your literature review, based on specific topics you’re researching. 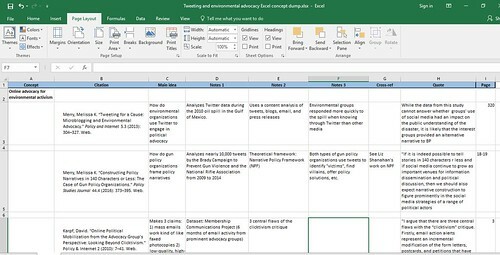 The Conceptual Synthesis Excel Dump will help you create headings for your literature review, provide you with accurate quotations for your paper, and give you a snapshot, bird’s-eye view of where your paper is situated and the gaps in the literature, but it is NOT an actual scholarly output. Annotated bibliographies, banks of synthetic notes and literature reviews are actual research products. 5. Repeat the process until reaching conceptual saturation. Depending on how in-depth I want to go, I write rhetorical precis or synthetic summaries of each article, and then dump them into my Conceptual Synthesis Excel Dump for that specific topic. I may also want to create an annotated bibliography. But sometimes I am so busy that I simply go from the Conceptual Synthesis Excel Dump to writing the literature review. Most people I know write first an annotated bibliography and THEN, based on the results of their annotations, start writing their literature review. Since I am usually reviewing a body of works for a specific paper I am writing, I rarely have the time to write an annotated bibliography. However, something I may do is ask my research assistants to write an annotated bibliography on a broader topic and, based on that one, choose specific citations I may want to use for the literature review section of the paper I am writing. 6. Write the literature review as though you were answering questions about each subheading. The role of activism in policy change. Activist strategies’ repertoire: online and offline. Experiences of online activists’ in influencing domestic policy change. Environmental activists’ repertoires: online and offline. How do environmental activists use online strategies to influence policy change. Some authors, like Dr. Eduardo Araral, publish their literature reviews as scholarly pieces in international journals. This coauthored piece on Water Governance 2.0 is a really solid literature review with a critical component that provides additional insight than just summarizing the works published so far on the topic. This paper by Benson et al is another good literature review published as a journal article (on water governance and integrated water resources management). These pieces (by Miranda et al 2011 and by Batchelor) on water governance are not published as journal articles, but remain solid literature reviews. This literature review by the Pacific Institute on voluntary standards in environmental regulation is also quite solid. Overall, the exercise of undertaking a literature review is an important and necessary one for students both at the undergraduate and at the graduate level, and that’s why it is fundamental that we teach our students how to do them properly. 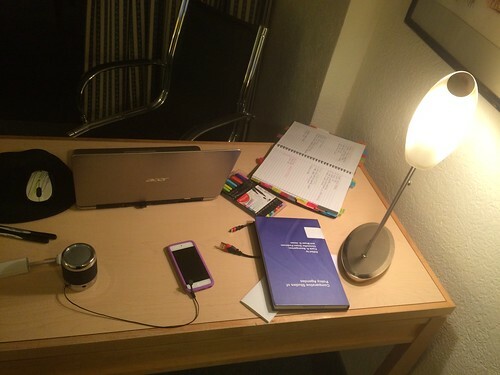 Hopefully my post will answer some questions on how to conduct literature reviews! Tagged with AcWri, literature review.